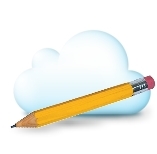 What does the 'pencil' or 'cloud' represent? The pencil represents those church attendees that have been doing the Bible studies that will eventually lead to either baptism or church membership, or both. Once a series of completed studies have been received, the pencil will appear next to your name in the poGm Conference room. The cloud appears when all the studies have been completed by a baptized member who has filled out the form seeking official church membership. Click here to see the list of Bible studies for baptism and or church membership. If you have been biblically baptized, and you agree with our Statement of Faith, please click here to fill out the form to join the Seventh Day Remnant church family.